The turning point in Uriel Valadeau’s musical education was his meeting Francis Chapelet, who awakened in him a passion for the baroque organ and the art of improvisation. In June 2006, at the request of Alain Paquier, President of Chemins du Baroque, Francis and Uriel gave the inaugural recital to mark the restoration of the two organs in Cusco Cathedral (Peru), dating from 1656. At the same time, they recorded a CD which received critical acclaim: 5 “diapasons” from the magazine Diapason and 4 stars from “Le Monde de la Musique”. He was described as a “stylistically accomplished organist, with a lively and vigorous approach”. It is this ideal that he sets himself, seeking to be free from dogma and conformism. They also gave the inaugural recital subsequent to the restoration of the oldest organs in the Americas, in Andahuayillas (Peru). This took place as part of a celebration created by Chemins du Baroque which involved some 90 musicians and an international press presence. 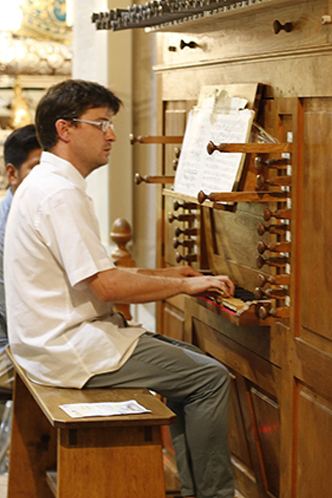 The event was captured in a magnificent recording by the K617 label, where the organ recital is placed in the context of traditional Peruvian music.